A car parked in Montreal's Villeray neighbourhood was set ablaze early Friday on Chabot St. near Jean Talon St.. Shortly before 2:30 a.m. people called 9-1-1 to report the car on fire. Firefighters arrived quickly and put out the flames before the car was completely destroyed, although it's not known if the damage is substantial enough to allow the car to be repaired. 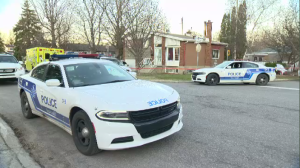 Because there were obvious signs that the fire had been deliberately started, the Montreal police department's arson squad will continue the investigation. They are expected to canvass the neighbourhood and check surveillance video in hopes of finding images of a suspect.